It is said that no other country has praised the bicycle in song, poetry and literature as much as Denmark. This love affair peaked in the 1930's and 1940's. Over at Cycle Chic we have a selection of historical cycling quotes in various posts. 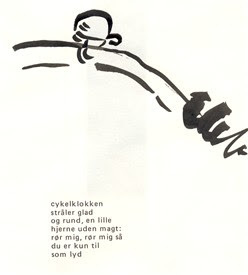 I found this poem and illustration, above, in a poetry collection by Fini Løkke. It's from 'Situations 1965-1969'. but nobody asked me to translate it so I'll get my coat.